The principal ingredient of chili is meat, usually beef, although pork, venison and other red meats are sometime used. Pardon me, but any dish made with poultry and chili seasonings is not chili. Maybe it's chili flavored turkey stew or something, but chili it's not. Whoa! We had a nice article about my dream kitchen all lined up for this month, but our readers are demanding CHILI. Ah, yes. After that long, hot summer the cooling winds of fall are coming down off the highlands signaling our bodies that chili is needed to fight off the ravages of the coming cold seasons. As I hope we all know, chili was invented in San Antonio, Texas, about the middle of the Nineteenth Century. It began as a simple peasant stew using materials inexpensive and at hand. Meat, chile peppers, comino, oregano and garlic made up the first recipes. All the spices except the comino grow wild in South Texas. The comino was imported from the Canary Islands by settlers in San Antonio in the 1700's. The reputation of the bowl of chili was carried all across the nation by the cooks of the giant cattle drives of the late 1800's. The dish always tasted good and was full of vitamins and minerals that made the body feel good. The fat content packed a lot of calories to fuel the cattle-driving machines known as cowboys. During the great depression, the "chili joint" came into existence and made it possible for anyone with a nickel or a dime to have a satisfying meal. The serving included crackers and ketchup. Many of the survivors of the great depression look back fondly on chili as one of the few bright lights in the ordeal. As the depression filled and the economy grew, chili lost some of its magic. There were, however, true believers who raised the lowly bowl of red to cult status. Most notable was the CASI that grew up around Dallas. Once a month or so, a group of these Chiliheads would gather to consume and tout the virtues of chili. They were serious in a humorous way. They wrote songs and poems about chili. They came up with rituals like The Crumbling of the Crackers to make their meetings entertaining. They distributed recipes to every part of the known world to spread appreciation of their favorite food. In 1967, at the ghost town of Terlingua, Texas, the first known chili competition took place. The object was to determine who was the best chili chef in the whole world. This happening grew into the huge chili cookoff industry that continues today. Every weekend, hundreds of chiliheads gather at dozens of chili cookoffs to find the perfect bowl of red. Okay, now you know a lot more about chili history - maybe more than you wanted to know. Let's get on with the nuts and bolts of the dish. My preference for chili meat is chuck from the arm of the bovine. Top round and rump roast make equally good chili. Remove anything white from the meat. The meat can be ground to chili size, which is as coarse as the grinder will cut. But I prefer hand-cut cubes of the meat, about one-half inch square. Another pardon me: Hamburger does not make chili; it makes chili sauce. The predominant seasoning is the chile. There are hundreds of varieties of chile peppers. 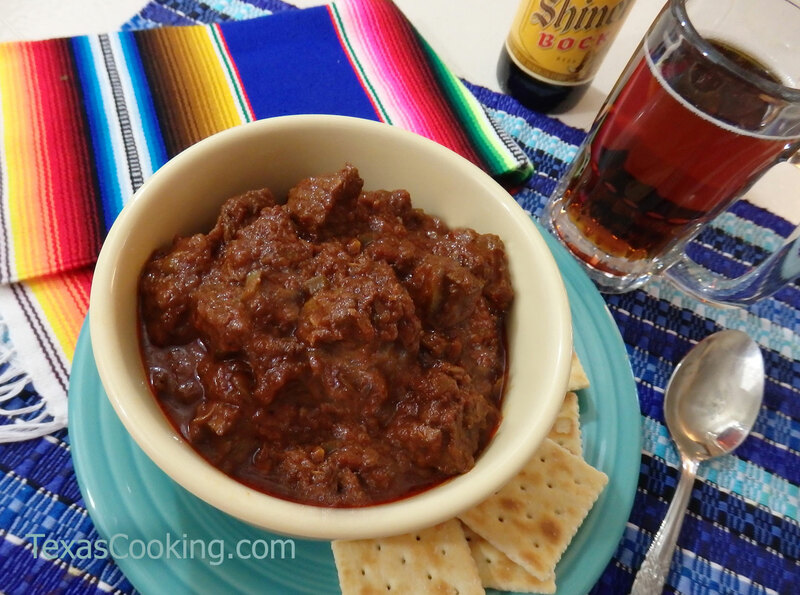 The original and still favorite type for chili is the ancho. To add confusion to the issue, ancho chiles, when green, are known as poblanos. But we are dealing here with the ancho, which comes to market dried. It will be dark, reddish brown and look a lot like a run-over bat. However, when reduced to powder or reconstituted with water it makes wonderful chili. Only the traditionalists still make chili from ancho pulp. This requires removing seeds and stems from the dried pods, soaking them in hot water and then removing the pulp with a food mill. Just too much work for the average cook. The chili powder we buy to make our bowl of red is actually a chili blend or spice mix. It contains among other things, cumin, oregano and garlic. A pure chili powder without the added seasonings is chile molido. The cumin starts life as comino seeds -- tiny seeds that are very aromatic and pungent. Cumin is simply ground comino seeds. Comino can be used in the chili, although most folks prefer the cumin. If you want to try the comino, toast the seeds in a heavy skillet before you add them to the pot. If you have a way to grind the seeds, toast them first and then grind them. It really improves the flavor. Cumin is the spice that gives chili its heavily distinctive aroma. Red pepper or cayenne is what puts the bite in your chili. Cayenne has what is called a back bite. That is, it takes a few seconds before it grabs your taste buds. Most folk can't abide too much red pepper. Go easy on it to start. Millions of words have been written on the subject of how to construct a proper pot of chili. If you are really interested in learning a lot more, go find a copy of The Great Chili Book: 101 Variations on "The Perfect Bowl of Red" by Bill Bridges . Here's a starting recipe for chili novices. This recipe will get you started on your way to becoming a fine chili chef. Experiment with the recipe. Try different brands of chili powder. If you end up with two favorite brands, mix them half-and-half and see what result that brings. Garlic needs to go in the pot in the last half of the cooking process as it will lose its whomp if cooked too long. Oregano will become bitter with too much cooking, so it too needs to go in toward the end of the cooking time. Chili that is bitter can be sweetened with a little dark brown sugar. Just enough to kill the bitterness. Chili that is too salty can be rescued by boiling a peeled potato in the pot. The potato will absorb a lot of the salt. Also, if your chili comes out way too thin, add some instant mashed potatoes. This will also absorb salt and is an easy way to stretch a pot of chili when an unexpected guest shows up. Most of all, experiment. Read all the recipes you can find. This way you will be ready for that cool weather that demands CHILI!